Western States received a 2009 PEAK Award of Excellence for the beautiful gold and blue La Dolce Vita wine label. The label tells more than a story of beauty; it illustrates how Western States brought solutions and cost savings to this customer. La Dolce Vita had two obstacles to overcome: getting the hot foil stamped embossed product they'd been using to adhere well to their bottle; and getting this label to work well with their applicator. 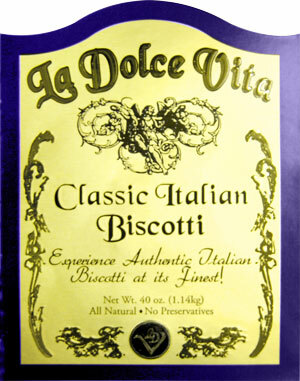 Western States worked with La Dolce Vita to determine that a dull gold label material with a slightly lower reflective property was better suited for their applicator. We also helped them save money by creating a cold foil transfer and embossed label with our specialized, internal embossing process. This eliminated the need for the costly steel tooling die that La Dolce Vita had been using. After several test runs, this customer was delighted with the award-winning results.